When a rich gentleman finds a beautiful young woman lying in the snow, on the brink of death, he takes her back to his house and, when she has recovered, employs her as a maid. Immediately Elira realizes that Anthony Luther is no ordinary man and nothing about the house she now lives in is as it seems, for Anthony is a powerful wizard. Inexplicably drawn together, they begin a tentative romance, but it’s not Elira’s uncertainties and the rules of upper-class society which drive a wedge between them; rivalries and a precious family heirloom, a priceless necklace of unforeseen power handed down through generations, threaten no only the couple’s happiness, but also their lives and the safety of the people around them. 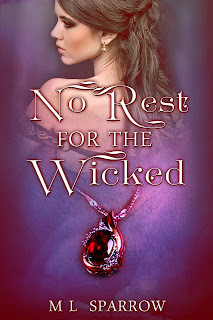 No Rest for the Wicked will be released December 1, and available for preorder now!